Our second dedicated Living Standards Outlook, combines survey data, OBR forecasts, the government’s tax and benefit policies, and more, to project household income growth for different groups. This report contains the Commission’s conclusions, drawing on a deep and wide-ranging examination of the experiences and prospects of different generations in Britain. The Resolution Foundation’s response to the 2019 Spring Statement. Click on opportunities to find out more. Those Easter Eggs you're stocking up on - are you buying them online or in-store? 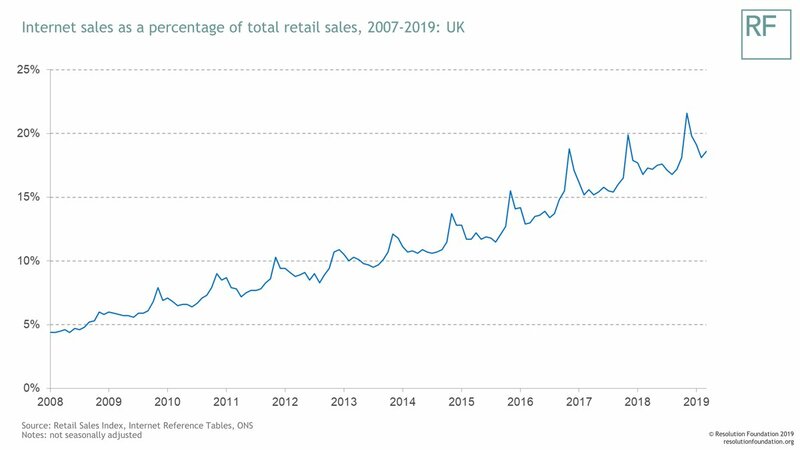 The retail sector has changed a lot over the past decade – online now accounts for just under a fifth of all retail sales, up from less than five per cent in 2008.